While working on a large scale projects it is not uncommon that the source code is stored in more than one repositories. Devart’s own projects are not an exception. From the very first release of Review Assistant there was the possibility to associate several repositories with a single project. However, while creating a new review there was only the possibility to add files from one repository. In most cases code changes to be reviewed are located in a single repository. However, there are cases when several products have shared code stored in a separate repository. In such cases a new feature may require changes in two repositories. Then, the code review should contain code from two repositories: the shared repository, the specific product repository. Upon that, it is logical to combine changes stored in separate repositories in a single review. Previously, developers have had to create two separate reviews and make reference between them in comments. Devart’s developers use Review Assistant in their work, and they suffered this inconvenience: they couldn’t add code from several repositories to a single review. That’s why they had been looking forward until the new feature appears. And now in Review Assistant 2.0 you have the possibility to use this feature as well. It was one of the Review Assistant 2.0 features that required UI changes. Some of our users were faced with other difficulties related to repositories location structure. The core of a problem is that a repository containing common code is nested to the main project’s repository as a sub-folder. 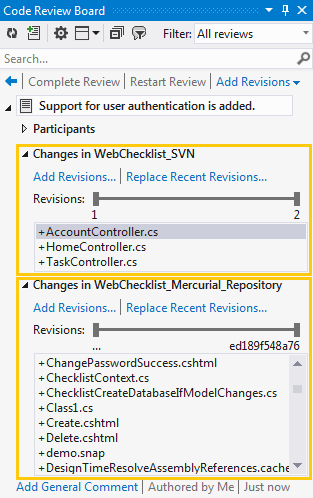 Previous version of Review Assistant didn’t allow users to add second repository to a project in case it was a nested sub-folder of the main repository. In Review Assistant 2.0 we have eliminated this restriction.